Anybody know anything about fossils? This especially goes out to fossil collectors. I just finished my MA and don't have a job yet, so addmittedly when I find 1 I will be financially restrained for a while. But I am in love with fossils, particularly those of aquatic apex predators. I just purchased a megalodon tooth which is definately real. I want to acquire another but since it is from a close friend who won't sell his larger ones, I will have to find it through a fossil dealer. I also want to eventually acquire a tooth collection of apex predators -- the mosasaur and ginsu sharks particularly (I doubt Liopleurodon's are for sale since they are so rare). Anybody know reliable websites for fossils, how I can tell if it is authentic, and whether carbon dating is something one can learn on one's own or can be done for a reasonable price range with minimal damage to the tooth? I just finished my MA and don't have a job yet, so addmittedly when I find 1 I will be financially restrained for a while. But I am in love with fossils, particularly those of aquatic apex predators. I just purchased a megalodon tooth which is definately real. I want to acquire another but since it is from a close friend who won't sell his larger ones, I will have to find it through a fossil dealer. I also want to eventually acquire a tooth collection of apex predators -- the mosasaur and ginsu sharks particularly (I doubt Liopleurodon's are for sale since they are so rare). Anybody know reliable websites for fossils, how I can tell if it is authentic, and whether carbon dating is something one can learn on one's own or can be done for a reasonable price range with minimal damage to the tooth? First, Mazel Tov on getting the MA. Best of luck in finding a job. Just a real quick comment on Radio Carbon Dating -- that's not what's used on fossils from the time period you're looking at. 14C dating is limited by the relatively short half-life of 14C, as compared to the age of, say, a Megalodon. There are other radioactive materials with longer half-lives that can be used, but you're unlikely to be able to measure the rates of decay from those specific isotopes in your garage either. I had a small fossil collection back when I was a teen. Not sure where it went, or which time we moved that my parents tossed them out as "rocks". They really are fascinating. I've never scene a fish-fossil, so PLEASE SHARE PICCIES! Thank you for the congratulations and the information you shared. I want to learn more about carbon dating. The one I am holding in my picture is my Megalodon tooth. I know it sounds silly but I named him George and like to imagine him as my pet despite the fact that I am 33 years old. He was probably around 40 feet, though the slight angle may suggest he was bigger because the teeth became smaller the farther back they went. I think I should probably find a better method of spotting a fake since I lack a science degree or the appropriate skills which would probably take a lot of time and resources I don't have. You sound like you're interested enough to get into paleontology. Perhaps digging up your own fossils. It's been almost 30 years, but in Drumheller Alberta they used to do tours into the badlands were they teach you a few things about fossils and then proceed to do field work and actually look for them. It could be a rewarding experience for you. Thank you for the congratulations and the information you shared. I want to learn more about carbon dating. 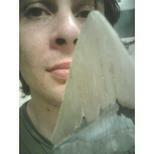 The one I am holding in my picture is my Megalodon tooth. I know it sounds silly but I named him George and like to imagine him as my pet despite the fact that I am 33 years old. He was probably around 40 feet, though the slight angle may suggest he was bigger because the teeth became smaller the farther back they went. I think I should probably find a better method of spotting a fake since I lack a science degree or the appropriate skills which would probably take a lot of time and resources I don't have. Carbon-14 dating is fairly straight-forward. Radioactive elements have well-understood methods of decaying and emit well-known particles (or whatever) when they decay. Carbon-14 turns into Nitrogen-14 by emitting an electron -- that's what's detected. The half-life of 14C is 5.730 years, or every 5,730 years there is half as much as before. After as many 5,730 year periods that have passed since Megalodon was swimming around, there wouldn't be any Carbon-14 left. If you know how many decays per unit time, and you know how much total carbon is present, you can calculate how much is Carbon-14. From there you calculate the half-lives that have passed, and that gives you the age. That's pretty close to zero, even for huge numbers of decimal places. Learning about dating methods is well worth your time. Coming from a religious background and believing the earth was only 6000 years old, I knew it was important for me to understand. What religion taught me was carbon dating 14 is a lie. I was told it even dated a live mollusk to be a million years old. Studying what C14 dating was really about I immediately learned this isotope only measured to just under 6000 years, so the lie of YEC Christians was then immediately apparent. An isotope other than C14 would have to have been used to measure a million years. There are others who understand this area far better than I and welcome Furry's notes above. It is not easy to grasp especially with someone like me as my major was Theology. So I have found go over it repeatedly, hearing it stated in different ways, and me writing about it helps. I found a book by Benjamin D. Wiker called "The Mystery of the Periodic Table" to be helpful. It is intended for high school level, but that is where I am. Carbon is one of the elements in the periodic table. There are over 100 elements. Elements can have variations. There are stable elements such as Carbon 12 & Carbon 13, but then there are radioactive isotopes (variations) as well and Carbon 14 is one. There are over 1000 isotopes. Radioactive isotopes can lose neutrons and turn into a different element (C14 to Nitrogen-14). This loss is at once predictable and random. You don't know which element will lose a neutron, but the loss rate of the collection of elements is steady. So you can determine the half-life for each element by this rate of loss. C14 is just under 6000 years. The reason for the half-life is because there is nothing to measure once all the radioactive isotopes have turned into another element. Here is a list of radioactive isotopes in their half-life order from shortest to longest. As you can see it is quite a range of time and the great thing is more than one isotope can be used for measuring the age of an artifact. Then are are a host of other dating methods such as tree rings (with daisy chaining), coral rings, etc. These can be used in some instances as validation and certainly confirmation of the process. 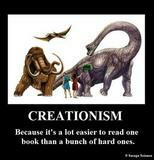 I really need to know this to shake the YEC delusion. If you do confront a YEC with this information then they tell you the law of physics changed after Adam ate the apple. That is really hard to swallow (pun intended) to keep the delusion going. I believe to do such measuring you need to purchase a accelerator mass spectrometer. A simple spectrometer is insufficient. It looks like it would cost over $100k. I do understand that isotope dating must be carefully done. Contamination is the worst scenario and that causes YEC's defenders to drool. I would welcome anyone correcting me or telling me I am on track with the info above. Thanks, I will check out those articles. Yeah, I was given a very poor representation of evolution and science in general as a child growing up in the fundamentalist midwest. I am making up for it as an adult 20 years later. You should have grown up in my house -- Dad was a sometimes rocket scientist who didn't believe in Evolution and Mom was a biologist who eventually became an engineer -- we had many of the same professors as she started her BSME after I finished my BSCS with ME minor. Both were Christians, as was I at the time. Lots of G-d, lots of Science. At nine I had an experience with gravity and broke my arm. While we were waiting, about six hours total, in the ER for some nice doctor to come and set my arm (badly), Mom read me Origin of the Species. Because I also broke a foot (it was a Two For One special), I had to stay home for a few days before I could walk (slowly) -- it's hard to use crutches with one arm in a cast. During that time she read me more of her Biology books and I learned much of the foundation I learned in regards to Evolution. I think by 11 or 12 I had about the same understanding of Evolution as a college freshman in Biology. The real shame, for anyone who happens to believe in G-d and is taught Intelligent Design, is that the Bible doesn't say "This is how G-d did it and anything else is a lie." When my son was first showing signs that he was heading towards Atheism, his religion teacher (we sent him to a religious school) gave him one of the Intelligent Design books -- I forget which one, but it's one of the ones that says an eye can't evolve. So, I sat down with him and explained how something like an eye evolves. He went on to become every bit the nuisance I was -- during a class on Martin Luther, his teacher asked if anyone in class knew anything else about Martin Luther. So, he raises his hand and says that Martin Luther killed a lot of Jews. Since he was going with me to Jewish morning prayers on a regular basis, this did not seem to go over well with his nice Christian religion teacher. I love him. He's a great kid. Geologist here. Even if you were to purchase a mass spectrometer, that wouldn't do you much good. The sample has to be prepared properly, the procedure performed properly, the data interpreted properly, etc. Also, the mass spec would have to be calibrated and maintained in a controlled environment. Most institutions have full time techs for that. And yes, what everyone is saying about radiogenic isotopes is pretty much true. C-14 won't do you any good whatsoever. There are other radiometric age dating techniques that can be used on fossils, but really your best and most inexpensive bet would be to find a paleontologist, preferably one that focuses on those types of animals. It shouldn't be too hard. Most universities have contact information for their professors and researchers on their websites, and often times the person's area of specialization is also listed. If you aren't sure if the professor/paleontologist you have found is in the right specialization field, you can probably google them to see what they've published papers on. Really though, most paleontologists with a PhD could tell you if your fossil was real.